Graham O'Sullivan read English Literature at Cambridge University, and whilst an undergraduate began studying baroque flute with Rachel Brown. He went on to study as a postgraduate at the Royal Academy of Music with Lisa Beznosiuk and scholarships from the Countess of Munster Musical Trust and the Leverhulme Trust supported further studies with Barthold Kuijken at the Royal Conservatory of The Hague. 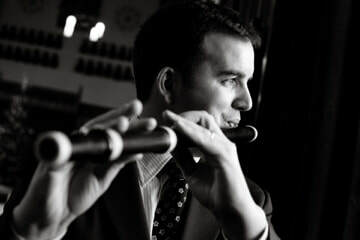 Graham has given recitals on both flute and recorder across the UK, in continental Europe and the Far East. As as an orchestral musician, he has performed and recorded with the English Baroque Soloists, the Drottninghom Baroque Ensemble, the Hanover Band, the Academy of Ancient Music, the English Concert, the Gabrieli Consort and Players, the Sixteen, Ensemble 28, Ensemble Marsyas and the European Union Baroque Orchestra. He is a member of the Dunedin Consort with whom he has toured across Europe, and with whom he has participated in numerous recordings, including their award-winning recording of Bach's St John Passion, as well as their recordings of the St Matthew Passion, the Mass in B minor, the Christmas Oratorio, and their recently released recording of Monteverdi's Vespers. Graham is a founding member of The Herschel Trio and Duo Boucon.